Encanto is the Spanish word for enchanted, which is a fitting name for Phoenix’s charming Park. Encanto Park is another wonderful place for families and the community to gather together. There is an abundance of friendly recreation and entertainment accessible at this park. 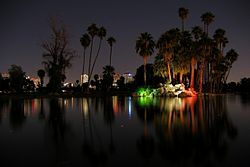 Enchanted Island is one of grandest and most popular attractions of Encanto Park. The entire island is an amusement park mainly for children ages 2 to 10 years old. There are so many cool rides that the park has to offer. One of the classic rides of the park is the C.P Huntington train tour. This is a miniature train that goes complete around the island at its leisure. Another favorite is the Red Baron Ride, where riders may maneuver there own airplane. You will also find Bummer Boats, Encanto Carousel, Parachute Tower, Dragon Wagon, and many others. Enchanted Island has a snack bar too, with traditional carnival fare foods such as cotton candy, popcorn, hot dogs, and frosty beverages. Enchanted Island is excellent place to take the kids! Admission to Enchanted Island is always free, although tickles are required for the different types rides. Tickets can be purchase right at the park. An All-day or All-year pass is an economical option to experience most rides. However, you can get an even better deal if you have Pogo Pass membership. A Pogo Pass is good for a 1 Day Pass for 4 separate visits to Enchanted Island Park. What’s so great about a Pogo Pass membership is that allows you to visit many other intriguing places. Currently a Pogo Pass is 60% off with the promo code! Encanto Park has many picnicking areas for all types of gatherings. There are plenty of grills spread out among the picnic areas. Play ground equipment and lengths of nature trails are also conveniently nearby. However, alcohol, inflatable jumpers, and amplifiers are unwelcome in this portion of the park. Most of the picnic spots in the park are first come first serve. There are two picnic areas that may be reserved for special occasions. These two picnic areas are located on a small island know as Amphitheatre Island. If more than 50 people are expected to attend a gathering it is encouraged that you reserve a place at Amphitheatre Island. Amphitheatre Island will more easily accommodate large amounts of people. If the two picnic areas are reserved together they can hold about 300 people. The good new is, amplified sound is allowed at this location, but there is no access to electricity. There is no charge for reserving this island and reservations can be made up to 6 months in advance. Golf is another fantastic past time at Encanto Park. This golf course is one of the oldest in Arizona, it originally opened in 1935. Encanto Park golf course is still popular and has a pro shop, driving range, and golf school. The course has 18 holes, terrific scenery, and open all year round. Several different breeds of waterfowl make their home in the lagoon of Encanto park. This includes a few swans too. Fishing is also plentiful in the lagoon and in the water surrounding the park. The lagoon hosts catfish, trout, bass, and sunfish. More specific fishing information can be found throughout the park. Another great way to enjoy the outdoors at Encanto park is to take a relaxing or romantic boat ride on the water. Paddle boats and canoes may be rented at the lagoon. Surrounded by water are two lovely islands one of which has a very scenic waterfall. Unfortunately, swimming, wading, and private boats are prohibited at the lagoon. The list of fun could go on, basically Encanto Park has an activity for everyone to enjoy.